Dhaka, Jun 3 (Just News): Argentina boasts a frontline that would be the envy of any national side in the world. Having the likes of Lionel Messi, Sergio Aguero, Angel Di Maria, Paulo Dybala or Gonzalo Higuain in the side means they have one of the best forward lines in the coming World Cup. However, this is the same lineup which has failed Argentina in the previous World Cups and Copa America tournaments. Higuain has flopped when it mattered the most – missing crucial chances late in matches. Messi himself has been decisive in many fixtures but there has always been a very fine line between success or failure at the international stage. The legendary Number 10 dragged his country to the FIFA World Cup by scoring a hattrick in the final qualifier against Ecuador in a near-cataclysmic qualifying campaign. It seems that things work best for Argentina when Messi does everything on his own. But football is a team sport and at the elite level, teams formulate defensive structures that are especially designed to stop the diminutive Argentine from carrying the ball into the box. At this point what does Argentina need? A helper to feed Messi the kind of balls the Argentine can take advantage from? Di Maria, Aguero have not always worked wonders in that department. They might have helped Messi but has not done so with any consistency and definitely not in the biggest stages. This is where Cristian Pavon comes in. ‘Cristian Pavon who?’, one might ask. For starters he’s not a proven product like Messi, Aguero, Di María or Higuain. However, what you’ll get in the youngster from Córdoba is a lot of trickery, a lot of entertainment when the ball is at his feet and someone who can unbalance the opponent. The 22-year-old youngster from Cordoba, came up through the ranks of Talleres de Cordoba before he switched over to Argentine giants Boca Juniors. The Boca Juniors player relies on his pace to get behind the back line and trickery to beat his man. A very fast thinker, he's had a number of assists for Boca coming in from the wing, beating his marker and sending threatening balls into the area. Lionel Messi himself benefitted from one such assist created by Pavon as the Argentina captain completed his hattrick in the last friendly against Haiti. While Pavon is not a great finisher, he has made up for that with key passes. 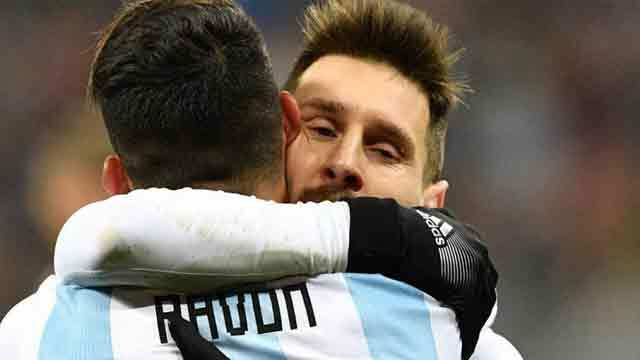 Coach Jorge Sampaoli even talked about the ‘Messi-Pavon connection'. "Cristian is a player who has very special characteristics for communicating with Messi," he said. "He goes to space, he is offering all the time and he has an important dynamic." In Argentina, many are already calling him ‘Messi’s new partner’. “He's a player that can play wide very well and can make a difference in the 1v1. He is a great alternative,” Messi added after Haiti match. Only time will tell how good Pavon can be in the important moments but for now Argentina will be hoping that the player, who can play either side of the pitch, left or right, can at the very least come off the bench and make an impact. Given that oppositions have seen so little of him, he could be the surprise element that Argentina and Sampaoli can turn to in Russia to ensure that Messi is not completely alone.